Earlier this year, Google announced its new low-cost Nearline cold storage service and today, the company is taking it out of beta and making it generally available. Unlike some of its competitors like Amazon Glacier, where accessing data in cold storage can take hours, Nearline promises to make data in its archive available within seconds. Now that the service is out of beta, Google considers it to be ready for production and its SLA promises an uptime of 99 percent. That’s less than the 99.95 percent for products like Compute Engine, for example, but that’s part of the cost savings (together with the higher latency) that allow Google to offer Nearline — which still runs on the same infrastructure as all of Google’s other cloud computing services — at less than half the price than its standard cloud storage service. With today’s launch, Google is also adding some new features to the service. The most important of these is on-demand I/O. With this, developers can get bursts of faster read speeds than the default 4 MB/s Nearline normally delivers. Google is offering this new feature for free for the first three months after launch. Google is also using this launch to make its Cloud Storage Transfer Service (previously known as the GCS Online Cloud Import service) generally available. Using this service, developers can easily import their data from Amazon S3 and any HTTP/HTTPS server into Google’s storage service and with Google’s new TCO calculator for Nearline, they can also now get a better grip on the cost of the service (and how it compares to AWS). 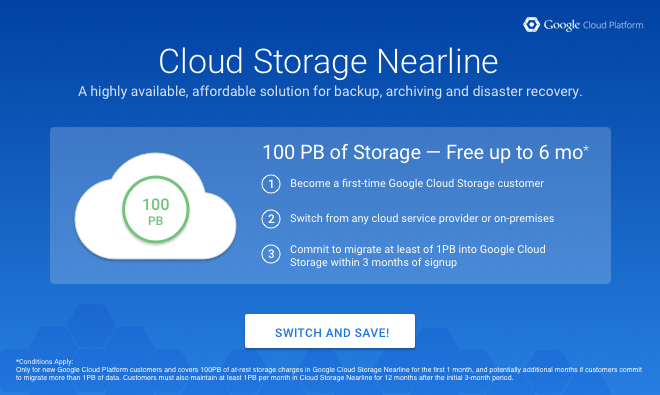 To further entice switchers, Google is also now offering customers who move their data to Cloud Storage Nearline from a competing service 100 petabyte of Nearline credit. That’s a rather unfathomable amount of storage (1PB = 1 million gigabyte) and there are some obvious catches here. The offer is only available to new Cloud Platform customers and only covers 100PB of storage for the first month “and potentially additional months of customers commit to migrate more than 1PB of data.” After that, you also have to maintain at least 1PB in Nearline for 12 months after an initial three-month period. 100PB is obviously a bit of a gimmick, but what’s clear is that Google would really like more businesses to move their data in Nearline, which is a very competitive service, both in terms of pricing and performance. Moving any amount of data between different providers, though, can quickly get complicated, so Google has now signed up a couple of new partners that will help their customers move to Nearline and/or have integrated Nearline into their services. These include Actifio, Unitrends and Pixit Media, as well as CloudBerry Backup and Filepicker.